Darcy Fort pushed his case for AFL selection with a team-high 20 disposals. Geelong’s VFL side has claimed a narrow victory in their practice match with Werribee, defeating the Tigers 11.7 (73) to 9.4 (58). In recent years, the two sides have become well versed in close matches and frantic finishes, and Friday night was no different. With only three points separating them at the last change, the match remained in the balance until the final minutes. 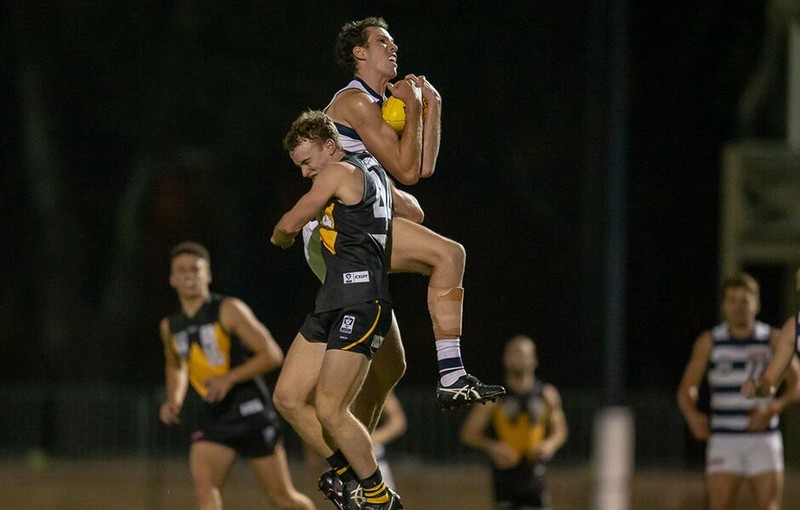 Werribee looked to be in control early in the final term before a Darcy Fort goal kickstarted the Geelong comeback. The Cats kicked the final four goals of the match to run out 15-point victors and claim their first win of the 2019 campaign. Only four AFL-listed Cats took the field but the VFL contingent performed admirably to help drag the side to a win. Recently appointed VFL captain James Tsitas kicked three goals in crucial stages of the game while Luke Smith chimed in with three of his own. Ryan Abbott and Darcy Fort formed a strong tandem in the ruck dominating in the air and on the ground. Fort had a team-high 20 disposals while Abbott also totalled 15 in limited game time. The duo combined for 49 hitouts and 14 clearances on a night dominated by the Cats’ talls. Wylie Buzza was also amongst Geelong’s best, kicking a goal while having a hand in numerous others. Scott Selwood made his return from injury but had limited game time due to a hamstring setback. The VFL Cats will look to continue their winning form next Friday, when they take on Collingwood in their third practice match. @ Avalon Airport Oval, Werribee.